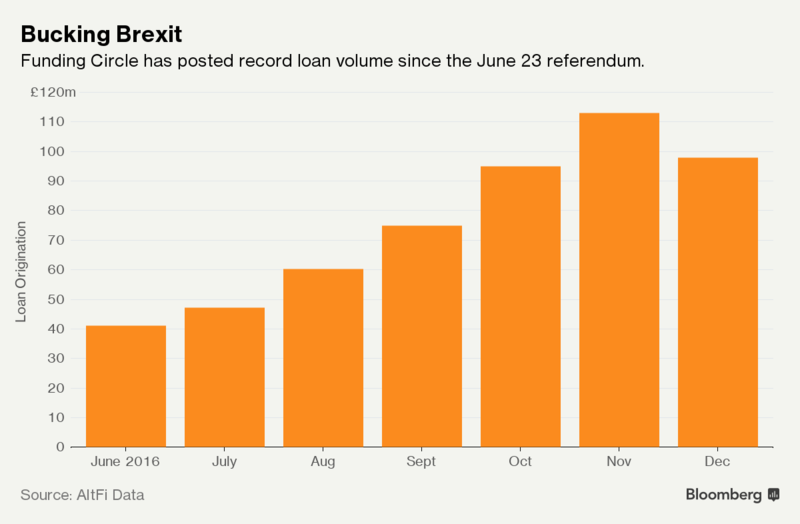 British peer-to-peer lenders were bracing for disaster when the U.K. voted to quit the European Union on June 23. Maybe they needn’t have worried. Funding Circle Ltd., the biggest online lender for small businesses in the U.K., has raised $100 million in equity funding , it said in a statement Thursday. Accel Partners, the Palo Alto, California-based venture capital firm, led the round, which included Index Ventures, Union Square Ventures, and Temasek Holdings Pte, Singapore’s state-owned investment company. Retail investors and borrowers have flocked to their platforms since the Brexit vote. The industry’s cumulative loan volume has surged by 28 percent, to 8.7 billion pounds ($10.6 billion), according to AltFi Data, a London-based research firm. Funding Circle’s lending has jumped by a third since the June 23 referendum. Some analysts say the Bank of England’s decision to lower interest rates to 0.25 percent from 0.5 percent in August prompted retail investors to seek profits in peer-to-peer loans that were, on average, returning about 5 percent. Others say investors paused in the months leading up to the vote and now are piling back into the space because the British economy has avoided a recession many economists predicted. In November, Funding Circle became the first online lender to arrange more than 100 million pounds in loans in a single month. The startup, which also operates platforms in the U.S., Germany, the Netherlands, and Spain, said today that its U.K. operations had positive earnings before interest, tax, depreciation and amortization in the fourth quarter. Zopa Ltd., the largest online lender to consumers in the U.K., also broke into the black on that basis late last year. Funding Circle’s round is the biggest in the U.K. since 2015. It bucks a drop in fintech investing in Europe and North America as startups morph into more mature businesses. In the third quarter, venture investing in British fintech firms skidded 42 percent from the year-earlier period to 64 million pounds, according to CB Insights, a New York-based research firm. The deal comes as Funding Circle and its ilk face a crackdown by the Financial Conduct Authority. In December, the British regulator issued a report finding that the industry fell short of providing fair and transparent offerings to investors. FCA Chief Executive Officer Andrew Bailey said the industry is growing so rapidly that platforms may be too complicated for retail investors to understand. This year, it may work with Parliament to implement new industry rules. Even so, Harry Nelis, a partner at Accel who led the funding round, said Funding Circle is in a position to deliver what venture capitalists crave — the ability to grow significantly. The firm dominates online lending for small companies in the U.K., a market that topped 5.6 billion pounds in the third quarter. And CEO Samir Desai is making a push in the U.S. market, which topped $417 billion in October 2016. “What we’re looking for is the possibility of something big, and in the U.K. alone you could build a business with a market capitalization worth several billion,” Nelis said. Funding Circle declined to disclose its valuation. The company, which has arranged more than 2.5 billion pounds in loans since its founding in 2010, was valued at more than $1 billion when it raised $150 million in April 2015. Last week, the British Business Bank, a government-owned development bank, made 40 million pounds available on Funding Circle’s platform for loans to small businesses.